Starring Mary Kay Place, Jake Lacy, Estelle Parsons, Andrea Martin, Deirdre O’Connell, Glynnis O’Connor, Joyce Van Patten, Kerry Flanagan, Phyllis Somerville, Celia Keenan-Bolger, Ray Iannicelli, David Tuttle, Marcia Haufrecht, Mike Hartman, Cara Yeates, Gabriella Rhodeen, Charles Weldon, Paul McIsaac, Danielle Ferland, Barbara Andres and Laura Knight. Distributed by IFC Films. 95 minutes. Not Rated. There is not much of a concrete storyline to Diane. It is more of a character piece. It is still well worth seeing due to a stunning lead performance by Mary Kay Place. Place is not the only great aging actress in Diane, either. She is surrounded by the terrific but somewhat forgotten likes of Estelle Parsons, Andrea Martin, Deirdre O’Connell, Glynnis O’Connor, Phyllis Somerville and Joyce Van Patten. Terrific actresses all, each one getting rare intriguing roles. Not only is Diane a character piece, it is a look at a close-knit community. This is one of those little New England hamlets where everyone knows everyone else’s business, everyone looks out for each other and will do anything for someone else. Interestingly, even though no one acknowledges it, or even probably notices it, these aging women seem to be the town’s infrastructure. Behind the scenes, they are the ones that keep things going smoothly. Place plays the title character, an aging woman who tries to put on a brave face even though she is in near constant psychological misery. Her friends are dying off with frightening regularity. Her son is a hopeless drug addict (and later, even worse, a devout born-again Evangelical Christian). Her cousin is dying of cancer and cannot totally forgive Diane for a long-ago fight. (Diane stole a guy she knew the cousin liked.) Diane tries to keep herself busy – checking in on neighbors, caring for her beloved cat, working at the local soup kitchen and delivering meals to neighbors, researching rehabs for her son and hanging at a local bar at nights, drinking alone. She is sick and in pain and doesn’t know what happened to her youth. She takes the weight of everyone’s problems on her shoulders, mostly because she can’t bear to be alone with her own problems. Life hasn’t turned out like she expected. Not even close. But she gets up every day and trudges on, trying to come to terms with her reality. And the acting – by Place and her mostly under-employed co-stars – is just spectacular. 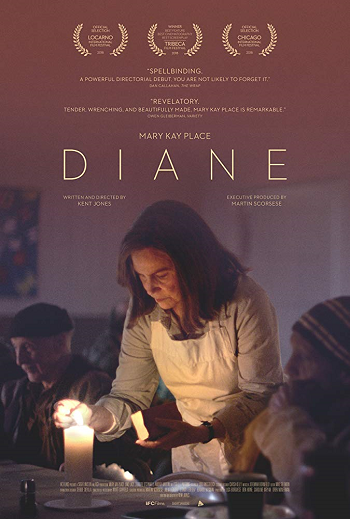 Diane is the first dramatic feature by acclaimed documentarian Kent Jones (Hitchcock/Truffaut, A Letter to Elia) – and it shares the quiet, matter-of-fact intimacy of a well-made doc. Diane is a slice of life, but the life it is exploring is full of fascinating wrinkles. Women like Diane usually do not get movies made of their lives. On the evidence of this quietly devastating little film, perhaps they should. Tags: A Letter to Elia, Andrea Martin, Barbara Andres, Being John Malkovich, Cara Yeates, Celia Keenan-Bolger, Charles Weldon, Citizen Ruth, Danielle Ferland, David Tuttle, Deirdre O'Connell, Diane, Estelle Parsons, Gabriella Rhodeen, Girl Interrupted, Glynnis O'Connor, Hitchcock/Truffaut, Jake Lacy, Jay S. Jacobs, Joyce Van Patten, Kent Jones, Kerry Flanagan, Laura Knight, Marcia Haufrecht, Mary Hartman Mary Hartman, Mary Kay Place, Mike Hartman, movie review, Paul McIsaac, Phyllis Somerville, PopEntertainment.com, Ray Iannicelli, The Big Chill. Bookmark the permalink.